There is no better form of entertainment at any birthday party than inflatable bounce houses. If you are a bounce house rental business, you can buy commercial inflatable bounce houses through our website. Kids and adults alike can jump, tumble, and have hours of fun in our commercial inflatable bounce houses for sale. When you buy commercial inflatable bounce houses for sale, you can be sure that you will get a ton of use out of them. This is because inflatable bounce houses are perfect for a variety of ages and events. At UltimateJumpers.com, we manufacture different types of durable inflatable bounce houses for sale. Regardless of the size of the party, we have got you covered! The wide range of commercial inflatable bounce houses for sale we offer is truly unmatched. The fun colors and themes make them the perfect addition to any event or party. For example, inflatable bounce houses for sale are great for birthday parties, barbecues, and other outdoor celebrations. In addition, the different sizes of commercial inflatable bounce houses for sale means that kids of all ages can get in on the fun. Whether you need a neutral-colored bounce house, a vibrant bounce house, or a princess bounce house, we have got you covered. The inflatable bounce houses manufactured by UltimateJumpers.com are made of durable commercial vinyl. In addition, child safety is always a priority during the unit design and manufacturing process. 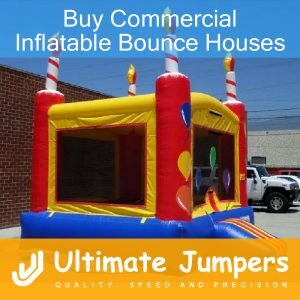 To conclude, you will not find another company that has such a wide variety of commercial bounce houses for sale than UltimateJumpers.com. We provide high quality products at great prices!